As part our of "healthier lifestyle" -- not that our lifestyle was grossly unhealthy before -- I made this salad to accompany our lean pork souvlaki and our lean chicken souvlaki. Don't ask how, but we had a ton of odd bits and ends of whole wheat herb foccacia bread (from Calabria Bakery, mentioned here and here). So, I simply toasted them until they were crisp. I made this "Greek-inspired" tomato salad by combining halved cherry tomatoes, red onion, orange and green bell peppers, and kalamata olives. 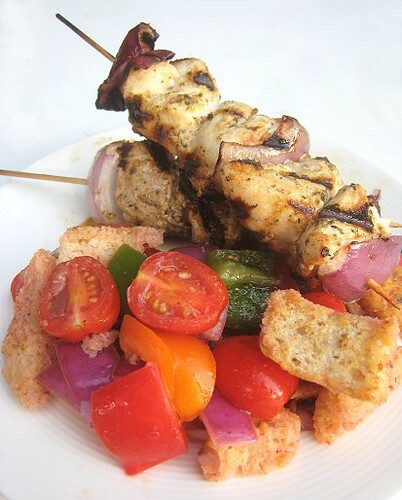 The dressing is almost exactly like the marinade for our souvlaki: lemon juice, olive oil, dried oregano and salt and pepper. To finish the bread salad, we added the bread! The toasted whole wheat herb foccacia pieces got tossed with the tomato salad. 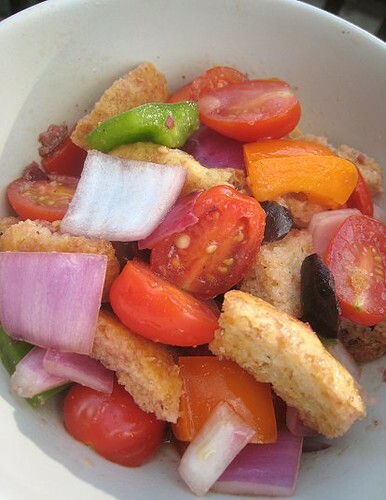 This tomato bread salad was very flavorful and satisfying. The toasted foccacia pieces, great by themselves, were made even better by the tomato salad juices. This is more a non-recipe than a recipe. Determine the quantities of each ingredient according to your personal tastes. Tear or cut stale bread into piece. 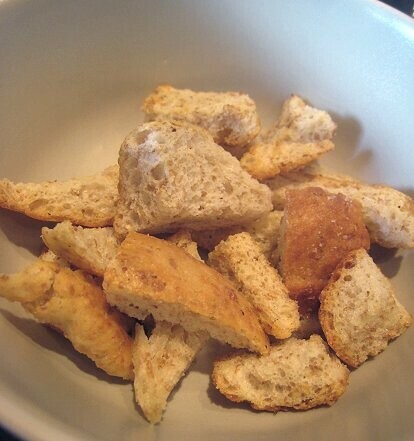 Toast stale bread pieces until crispy (like croutons). Set aside. Combine the rest of the ingredients together and adjust according to taste. 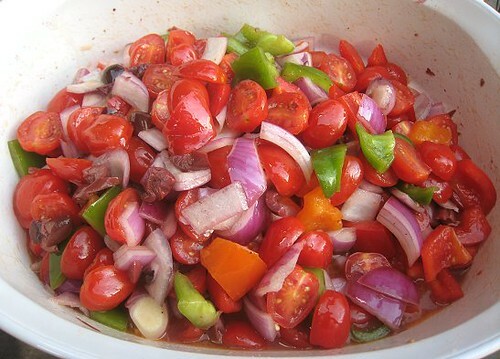 Toss tomato salad with toasted bread. Serve. There seems a lot of textural bite to this salad because of the larger chucks! Exciting! Oh, I haven't made a bread salad in such a long time, good idea! The seasons here in Vancouver have been a bit wonky... with it being warm in February (for the Winter Olympics! ), then cold again... Now, it's back to warm again and the days are definitely longer! We had to get rid of those foccacia bits somehow! I used to hate olives... not anymore, though. What a great combo. 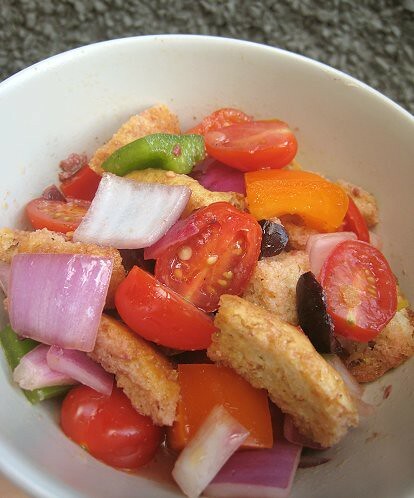 I love panzanella, but it's never quite enough to fill me up as a meal. 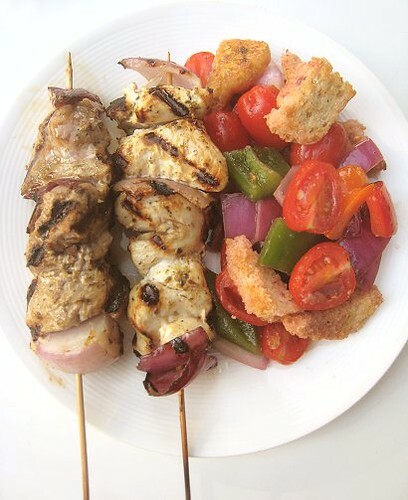 The souvlaki would totally do the trick though.